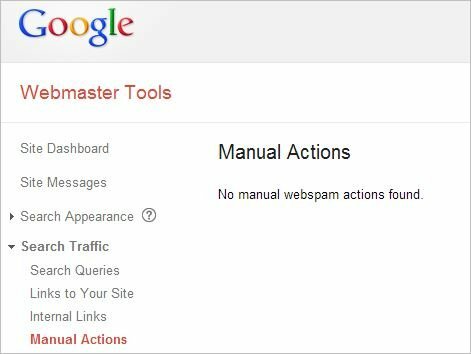 Today Google announced a new feature in Webmaster Tools that reports if you have a manual action against your site. I’m a bit surprised by this because it should already be abundantly clear to webmasters if they have a manual action against their site or not. Google has said time and again that if there’s a [recent] manual action against a site that they will notify the webmaster via email and display a message in Google Webmaster Tools. I guess people just aren’t paying attention. I think this tool was really released to help stem the tide of reconsideration requests that are coming from people who are confused of the difference between algorithmic and manual penalties. The last couple of years have seen broad algorithmic penalization of websites from Panda and Penguin. It’s been the biggest shakeup in many years. All these actions against websites have probably generated millions and millions of unnecessary reconsideration requests. Google says this report is an effort to be more transparent, but I believe they only created this “feature” to help their Webspam team which must be inundated with reconsideration requests from people who don’t understand how to tell if their site has a manual penalty. There’s no reason for them to be any more transparent than sending an email and issuing a notice in webmaster tools, unless to benefit themselves. Whatever the real reason, the “feature” is there and you can check your own GWMT account now to see, without a shadow of a doubt, if you have a manual action or not. Google’s new report on webmaster tools shows if you have a manual penalty or not – if you weren’t already paying attention to their other notifications.